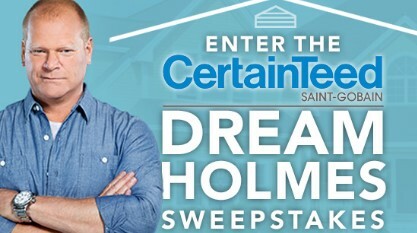 CertainTeed Living Spaces has your chance to enter once to win a trip to Florida to meet construction expert Mike Holmes AND $5000 worth of CertainTeed products for your home! PRIZE: One (1) in-home consultation with a CertainTeed design expert (not to exceed two (2) hours), one (1) $5,000 CertainTeed Product voucher, two (2) tickets to the 2017 International Builders Show, one (1) meet-and-greet with construction expert Mike Holmes to be redeemed at the 2017 International Builders Show (not to exceed one (1) hour), and a trip for two (2) to Orlando, FL, including round-trip coach class air transportation from the airport nearest the winner’s home city to Orlando International Airport (not to exceed $500 per ticket), ground transportation to the hotel (not to exceed $100 each way), three (3) night accommodations at a hotel nearest the International Builders Show based on duel occupancy and availability and length of stay (not to exceed $325 per night). Approximate retail value of the prize package is estimated at $36,100. HINT: You can get up to SIX entries total. See the rules for details.